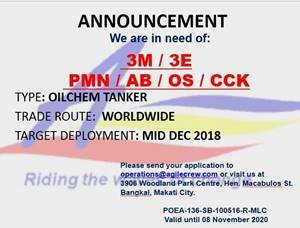 SEAMAN JOB INFO - Agile Maritime opening careers Filipino seaman crew work on oil tanker ship deployment mid of December 2018. Share to help other seaman looking jobs at sea. 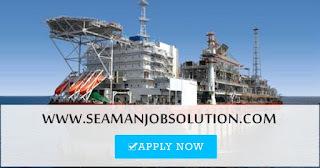 Jobs for seafarers and offshore. New jobs in maritime industry. Maritime and offshore career guide. 0 Response to "Able Seaman, Ordinary Seman, Cook, 3rd Officer, 3rd Engineer, Pumpman"